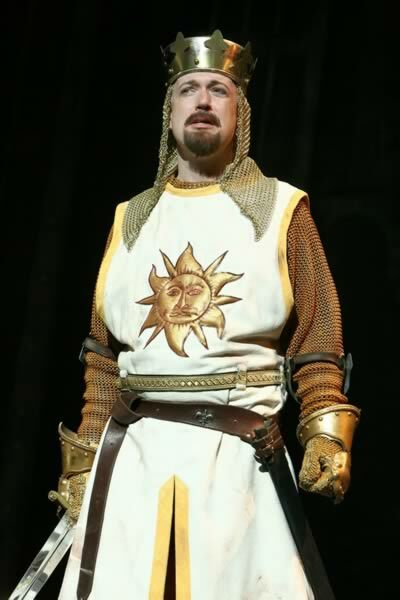 Regular listeners of the Chivalry Today Podcast know we’ve kicked off our fourth season with a show that included an interview with actor Christopher Gurr, who has just taken over the role of King Arthur in the touring company of the Tony award-winning musical Spamalot. The show is based on (or, as its creator, Eric Idle, says, “Lovingly ripped off from”) the motion picture Monty Python and the Holy Grail (released, believe it or not, in 1975). Last night (that’s “night” without a K) I got to see Spamalot, which, after my lengthy conversation with Gurr, gave me an opportunity to search for nuances and hidden messages within the show (as well as enjoying some classic bits and hilarious new material, of course). 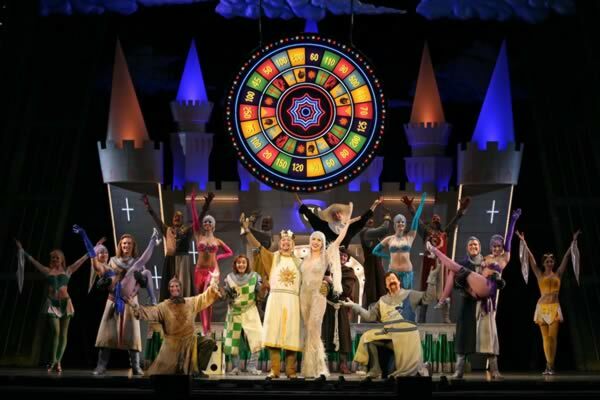 The show is all about bringing the visuals and jokes from the venerable film to life on stage — and in that, Spamalot succeeds delightfully. There are a variety of effects and production pieces that provide great visual humor — from the catapulted cow crushing Patsy to a pair of monks who provide “moving” scenery by rolling themselves in a backdrop. And there are also all the unforgettable scenes from the movie (“Bring out your dead,” and the knights who say “nee!”) that have been given just the right amount of updating. Enjoyable as all that is, however, what keeps Spamalot from becoming nothing but a regurgitation of jokes that were getting old when President Obama was in high school are the performances, primarily those of Gurr and Merle Dandridge, who plays the Lady of the Lake. Similarly, Gurr doesn’t mug for laughs or play Arthur as an empty-headed fop. While his knights find the humor in their roles, Gurr brings a sincerity and dignity to the character of Arthur — which, as he mentioned in the podcast, is the key to making the role, and the show, work. Even when Gurr is skipping about the stage with Patsy clopping coconut shells together to imitate hoofbeats, there’s an unmistakable regalness to Gurr’s carriage. He makes King Arthur the most emotionally engaging character in the show, and, even amid the wackiness, he makes the audience feel that King Arthur is the leader we all want to follow, and the ideal we all want to be. It’s a metaphor that plays out very nicely in the first musical number of the second act, “Look On The Bright Side Of Life.” Arthur’s down in the dumps and feels his quest has failed. His knights all come out to cheer him up and, amid gloom and thunder, they all whip out their umbrellas and begin to sing, whistle and dance; suddenly the sun is shining all around them, even though it’s pouring rain up above. 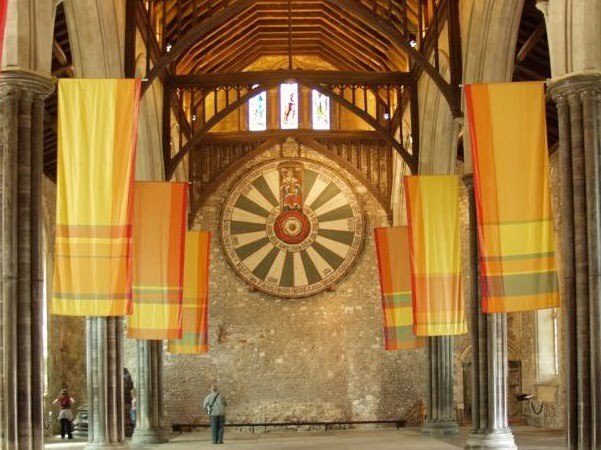 It’s easy to miss if you’re tapping your toes to the music, but the heraldic symbol on King Arthur’s tabard in this show (just as in the original movie) is not the traditional lion, dragon or Virgin Mary … but a shining sun. 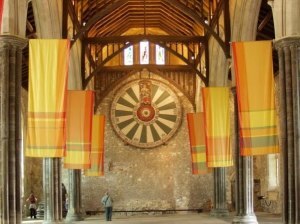 And that symbol is perfectly mirrored on the surface of the umbrellas the knights twirl as they’re “singin’ in the rain.” The message is simple and nicely underplayed: Arthur is the sunshine on a rainy day. Spamalot wasn’t created to reveal the emotional or moral depths of Arthurian legend, but this is just one of several moments in the show that demonstrate there is something thoughtful lurking under the jokes — a message that the image of King Arthur has been, is and always will be that ray of hope in an hour of darkness, the light of optimism and strength that glows even when the world seems cloaked in the clouds of doom. Though he maybe galumphing across the stage, tap dancing on the Round Table or enduring the merciless taunts of the French soldiers, Gurr portrays King Arthur in a manner true to the chivalric ideals of the 13th century Spanish knight and author Ramon Llull, who observed that, “Hope is the principle instrument of the office of knighthood.” And whether it’s proving the power of hope and joy to overcome adversity, or just putting a smile on our faces, King Arthur and the cast of Spamalot succeed in their quest most nobly. 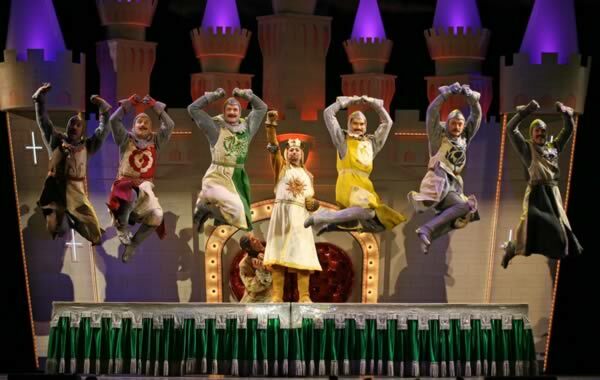 Spamalot runs in San Diego through Sept. 13; tickets are available through Broadway San Diego. The show also runs in San Jose, Tucson and Costa Mesa – more details are on the Spamalot website.